Though spring begins in March, it's the month of May that gets teens in America really excited -- soon they'll be sprouting from their khaki cargos and into yards of colorful tulle and dashing tuxedos. It's prom season, y'all, and with that comes celebrity prom proposals, a growing tradition in the US of A. Feel free to don a corsage or ruffled dress shirt while we celebrate the many ways that celebrities -- and their fans -- have taken part in the classic prom tradition. Technically, Kobe Bryant was already well on the way to fame himself by the time he asked a celeb to go to prom with him -- he was the first guard ever drafted to the NBA right out of high school. He asked singer Brandy to be his date to his high school prom in Philadelphia, and she agreed. The Bryant family actually paid for Brandy and her mom's flights to Philadelphia. So generous. "I had wrote a letter saying how much I loved his music to his fan club," Tupac superfan Kia Chanelle said of her experience with the iconic rapper in 1996. "At the end I made a joke saying that if he ever read this letter to please take me to my prom since my boyfriend had just broken up with me." 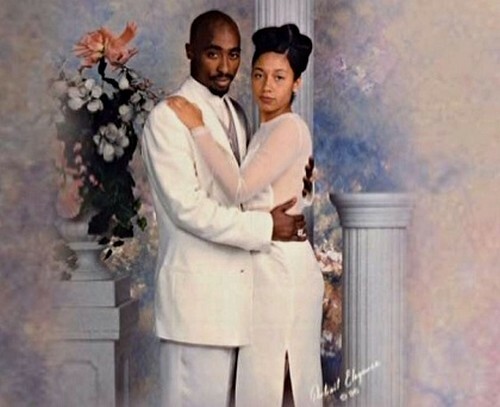 Well, instead of just ignoring her like she assumed he would, Tupac showed up at Chanelle's house one day unannounced, gave her and her family $1,500 in cash, and took Chanelle to the prom. A Rihanna superfan named Richard actually has MTV to thank for scoring an unforgettable prom with RiRi in 2007. The singer appeared on the show Once Upon a Prom and chose Richard out of a flock of dateless dudes. Rihanna, always bewitching, had such an effect on Richard that he was literally unable to function -- in the cutest way, of course. Selena Gomez, prom lover, was wandering the halls during a dinner party in 2009 when she came across Toronto high school Etobicoke Collegiate Institute's senior dance -- by chance. Gomez felt like going, so she did, inviting her pal (and fellow dinner guest) Demi Lovato to join. Taylor Swift followed Rihanna's lead and appeared on Once Upon A Prom in 2008. (Why is this show not around anymore? It made dreams come true.) Swift chose a lucky boy named Whit, and descended a staircase for their introduction into the prom, in the grand Swifty style we've grown accustomed to. Katy Perry has, hands down, the best celebrity prom story ever -- sorry everyone else (luv you RiRi). Katy was hanging with friends at a hotel in Australia when she came across Melbourne High School's formal dance in full swing. Perry not only crashed the prom -- reportedly after a few Foster's cold ones -- but she also enlisted two male attendees to dance to Beyoncé's "Single Ladies" with her. A teacher at the school later called Perry an "idiot" for the ruckus she caused, an assessment with which we heartily disagree. Katy just knows how to have a good time.